Bedrock Gardens is a private 20-acre garden in transition. The owners, Jill and Bob, are transforming their oasis into a public garden and cultural center that will be a destination for people interested in its horticulture, hardscape, sculpture, landscape design, and the arts. What makes Bedrock Gardens unique is the interplay of art and nature. Throughout the landscape are sculptural focal points that make visitors pause and absorb what is immediately in front of them. From the stainless homage to Julia Child complete with steel pearls, to the many whimsical and oversized birds, insects and animals, to the bawdy and shady Dark Woods, Jill and Bob pepper their mature, awe-inspiring, formal gardens with frolicking good fun. 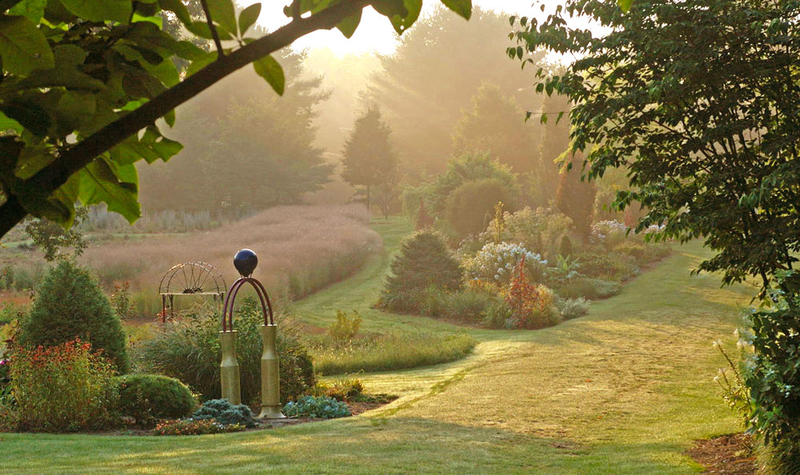 Bedrock Gardens hosts garden tours, special events, art shows, educational events, and more! Membership opportunities are available. Your contribution will help support the garden and gives you free admission to all open houses. For the 2017 year, Bedrock Gardens will be open the first and third weekends of the month, May through September, with the Second Annual Fairy Hobbit Festival on Columbus Day weekend in October. Unfortunately, drop-in visitors at any other times cannot be accommodated. Private tours and group events can be arranged. Check website for details on hours, directions, and upcoming special events.